Memsahibs’ Writings draws on the experiences of medical missionaries, travellers, journalists and administrators’ wives and is organised around key sites of contact. A comprehensive introduction by Indrani Sen places these writings in historical perspective. Categories: Gender, History, Orient BlackSwan, Publisher, Reference, Women's Studies. Tags: 9788125045526, Colonial India, Indian women, Indrani Sen. 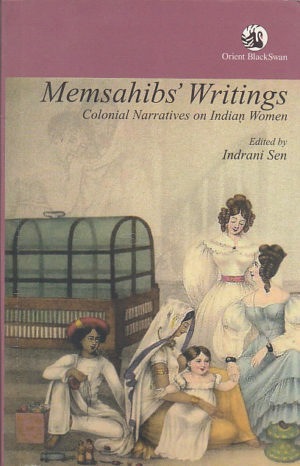 The white women of colonial India wrote extensively; they maintained journals and diaries, wrote letters home, authored novels and penned their memoirs. This anthology brings together a fascinating collection of such writings written over the period 1820s–1920s, focusing on their relations with ‘native’ women. Memsahibs’ Writings draws on the experiences of medical missionaries, travellers, journalists and administrators’ wives and is organised around key sites of contact. A comprehensive introduction by Indrani Sen places these writings in historical perspective.